Many of you use your Ford Ranger to travel off-road, and more and more of you are using them for camping trips. Anyone who has camped for more than a day knows how important it can be to have a fully charged battery. They also know how quick you’re battery can die if your motor isn’t running. This is where a solar charging setup becomes very handy. A solar setup can help you with simple things like keeping your phone charged, to providing enough electric to run appliances. Cell Phone Charger – If all you’re concerned about is keeping your cell phone charged while camping, then you can get a Portable Solar Cell Phone Charger. Battery Tender – A Solar Battery Tender (Maintainer) will help keep your battery charged if you plan to let the vehicle sit for extended periods of time. They work by plugging in to your cigarette lighter, or some also come with cables to clamp it directly to the battery. Important: The style that plugs in to your cigarette lighter will only work if the lighter works when the key is off. If your lighter jack only works with the key on, then you’ll need to use the battery clamps, or either rewire your lighter jack so it always has power, or added a secondary jack. Also, not all solar battery tenders have a voltage regulator to keep it from over charging. Portable Solar Power Kits – You can buy Portable Solar Power Kits that you can set up anywhere to offer either 12-volt or household AC current. Above was some ideas about portable solar options. Now let’s take a look at some more serious setups. If you have a camper (or SUV), then you may want to go with a hard mounted solar panel setup. In this setup, the panel is bolted to the roof and is permanently wired in. How many watts / amps do I need? How much space do I have available to mount it? Choosing the right solar panel wattage probably seems like the most confusing part of picking a set up. What size solar panel (wattage) do I need? Some just go with the biggest panel they can fit or afford. But it’s possible that one panel may not be enough. Solar panel – To absorb sunlight and turn it in to electricity. Controller – Think of it like the voltage regulator on your truck. The solar panel, just like your alternator, puts out more than volts than required to charge the battery. In the case of a solar panel it’s around 17 volts. 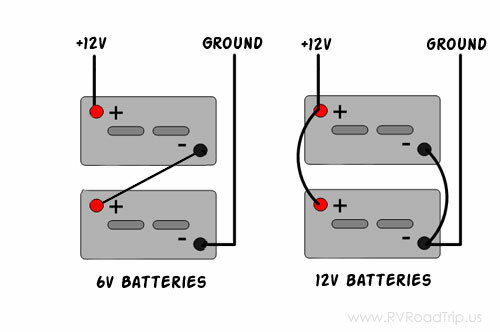 The controller controls the voltage going to the deep cycle battery you’re using in your solar charging system (deep cycle batteries require 14.5 volts to charge. Most car batteries require 13.6 volts). It will keep the batter charged, and keep it from overcharging. Battery – Your battery (or battery bank if you have more than one) stores the power being generated by the solar panel. You’ll need a deep cycle battery. The more Amp Hours (AH or AHR) it lists the better. Ideally you’ll want a 100AH battery. Batteries like Optimas Bluetop only puts out 50AH – 75AH. The VMAX SLR100 AGM 100AH battery is a good example. Inverter – An inverter can be added to convert 12 volt DC to household AC to run small appliances. Transfer Switch – A transfer switch (not shown) is used to hardwire inverters into a system where there is an alternative source of AC. It only allows one source of AC power to pass through it to the loads. This ensures that the inverter will not be damaged if the generator or utility power is hooked up while the inverter is running. How Many Amps Am I Using / What Are My Needs? Here’s a chart to use as a basic guide. Looking at the chart above, you’ll see that I calculated 39.6 amps used in a day. That’s a total of 475.2 watts (39.6 Amps x 12 Volts = 475.2 Watts). 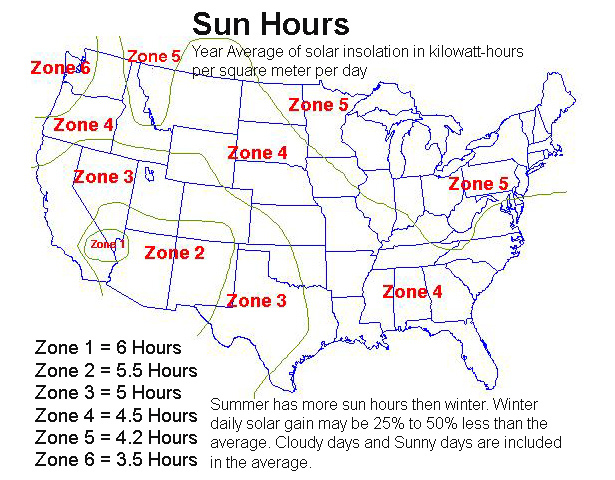 According to the sun chart below, the area I live in gets an average of 4.2 good solar sun hours a day. To simplify things, I’m going to round down to 4 hours. To regain 475 watts in 4 hours, my panel would have to produce 118.75 watts. If I wanted to fully recharge in 1/2 that time, I would need panels putting out 237.5 total watts. How Many Watts Am I Using / What Are My Needs? Looking at the chart above, you’ll see that I calculated 469 Watts used in a day (39 Amps). You’re better off getting a complete system than trying to piece something together on your own. This will ensure that everything is compatible and you get the best performance. Want to add to this article? Feel free to submit your comments HERE.